The most beautiful warm glowing yellows in paintings are often the result of the liberal use of the orangey yellow Gamboge. So warm and glowing is this color that it is said to be used to dye the robes of certain Buddhist monks giving the robes a rich saffron color. 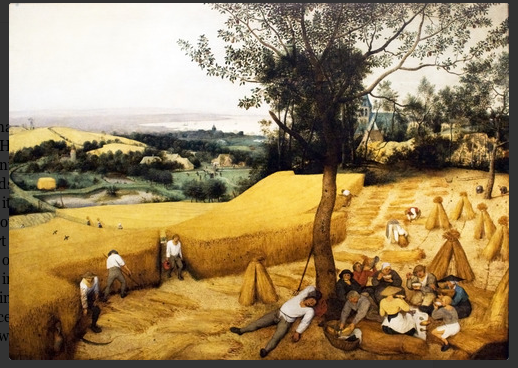 Gamboge is the color of the ripe wheat fields in Flemish artist, Pieter Bruegel, The Elder”s 16th Century painting of peasants at the harvest. Gamboge is the sun on a bright afternoon in late September. Gamboge was originally derived from the resin of the Garcinia tree growing in Cambodia, Thailand and other Asian countries of the region. The resin is collected in bamboo shoots until dried when the bamboo is then cut away. The resin of the Garcinia tree is considered a controlled poison in some countries due to the cathartic (according to Britannica,”drastic catharic”) properties of the fruit. However it is frequently found in small amounts in some herbal products used for weight loss and other physical issues. It is relatively harmless in small amounts. Modern Gamboge paint is no longer made with the resin of the Garcinia tree. Original Gamboge has a very poor lightfastness. Daniel Smith’s New Gamboge claims an excellent light fastness, “more staining than Yellow Ochre and equal in tinting ability to Raw Sienna.” New Gamboge lacks the fugitive properties of the original. 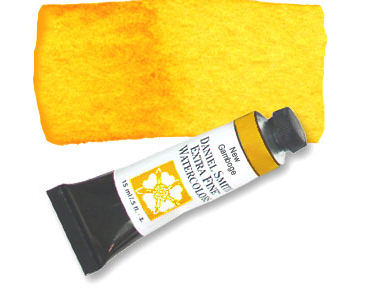 Beautiful, glowing warm yellows can be “poured” over any paintings with no worries of fading. RadioLab.org has a podcast titled “The Perfect Yellow” that tells the story of the origins of Gamboge along with some other interesting tales of the use of this versatile yellow. RadioLabs website discusses the use of Gamboge and other colors in experiments for teaching monkeys to recognize red. One wonders why on earth we would want to teach monkeys to see red? It’s bad enough when people see red. Just image being overrun by rampaging monkeys seeing red! And what if the monkeys start eating the Gamboge resin? What a mess we will be in then! Perhaps it is better to keep the Gamboge for paintings and leave the monkeys to their red-less vision. Gamboge is the yellow of warmth and happiness in many paintings. Its addition will add a beautiful golden glowing tint to many colors. Today’s Gamboge is free from the potentially harmful side effects of the past. Though today’s mixes lack the poisonous resin of the Garcinia tree, you probably wouldn’t want to eat it and please keep it away from all monkeys. Otherwise you will be able to experience the “happiness of Gamboge” in any painting. This entry was posted in art, art education, artists inspiration, color, Painting, Uncategorized and tagged Art, Color, Gamboge, Garcinia, Jonathan Meades, Painting, Pieter Bruegel the Elder. Bookmark the permalink. I love yellow. It’s a great color. It really is a happy color!